Lucy soon made up her mind that she wanted her Harry, and neither reason nor force would change it. Her parents tried to prevent meetings, but Lucy defied them; the lovers exchanged fervent letters. Lucy was violently emotional and inclined to hysterical scenes if crossed. Henry was the man she wanted, a strong, positive, cheerful man who could calm her seething temperament. Ignoring her wealthy parents’ protests and warnings of impending poverty and political ruin, Lucy married Henry Knox on June 16, 1774, shortly before Lucy’s eighteenth birthday, incurring her father’s displeasure by marrying a man in trade. Despite their vastly different backgrounds, theirs was a happy marriage, marred only by the fact that ten of their thirteen children did not live to adulthood. Boston at that time became a prison to its residents as General Thomas Gage refused to let the citizens leave to join the patriot army. When Henry escaped Boston to join the Revolutionary forces late one night in the spring of 1775, Lucy rode beside him, his sword sewn inside her cape. That set the pattern for their lives during the war years. From Bunker Hill to Yorktown, she remained as close to her husband as possible throughout the campaigns. After that, Lucy was essentially homeless throughout the war. She stayed with friends or in rented lodgings at times, but she always preferred to be with her husband. As a result of both need and determination, she managed numerous lengthy visits to camp, where she started to raise her family and served as a prominent social hostess. During the Revolutionary War, women usually joined their husbands after the active campaigning had ended in one year – normally during the winter, when fighting was suspended – and left the following spring, when the army was preparing for battle. The necessity of leaving the encampments was made clear early in the war. These women understood the difference between providing comfort when the army was in garrison, and creating a distraction when it was readying for a fight. 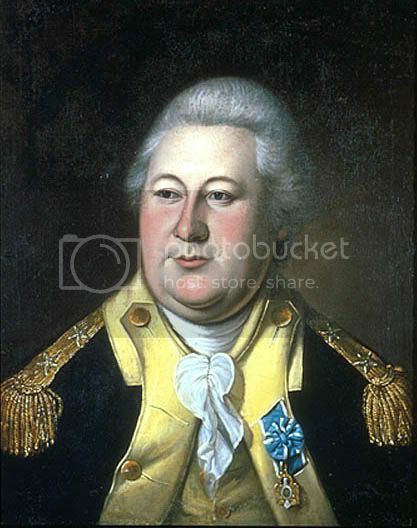 Henry Knox was one of the few volunteers who had any idea of military engineering or the use of artillery. 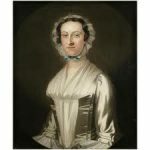 He was immediately put to work designing and building defensive forts at Roxbury, while Lucy, left among other Army wives in Worcester, spent her time awaiting letters and writing them. She was filled with pride that Henry was indispensable, but sobbed with self-pity at their separation. General George Washington inspected a rampart at Roxbury designed by Henry, and was instantly taken with the young man’s abilities, and Henry was immediately appointed Washington’s Chief of Artillery, a position in which he served from late 1775 through the end of the Revolutionary War. Throughout most of the war, he was by Washington’s side, and eventually rose to Major General. Knox suggested to the new Commander in Chief that an expedition be made to Fort Ticonderoga to fetch the equipment captured from the British by Ethan Allen. Thus Lucy had a glimpse of Henry in November 1775, as he travelled through Worcester to start the mission, and again in January 1776, when he returned with fifty-nine pieces of artillery that had been brought through snow and ice. These same guns, dragged onto Dorchester Heights above Boston, were trained upon the city and caused the evacuation by the British and their Tory sympathizers in March 1776. Lucy’s family returned to England, leaving the ardent young patriots in the war-torn colonies. She never saw them again. This may explain why Lucy cling all the more strongly to Henry: she had no other close family besides him and his brother. Knox told his wife of a little more than two years that 10,000 redcoats occupied the other side of New York harbor; by the middle of August there would be 32,000 redcoats to face-off against the 7,000 rag-tag troops the Americans had assembled. In the midst of this military showdown, Lucy’s letters allow us to see the human element of warfare. During the Revolutionary War, wives were known to accompany their husbands in their service to the nation. In a previous letter, Lucy expressed great desire to join her husband in New York, citing the travels of other general’s wives. With great emotion, Henry told her not to follow the example of another military couple as the officer is merely a man and “wants to see her because she is a Woman.” Knox wrote that his love for her was too great to risk her capture at this grave time. He was right; the Americans suffered serious setbacks in New York, which would keep them separated for some time. Throughout the next two years, Lucy’s life consisted of snatched visits with Henry alternated with dreary months in strange houses. She dashed to his side when Boston fell on March 17, 1776, and managed to go along with him when he toured New England ports to plan for their defense. She had to be left behind in Fairfield, Connecticut, for the birth of their first child Lucy, while Henry joined General Washington in New York. But Lucy was soon with him again, in spite of warnings that the unpredictable General Howe might attack the city at any time. She was delighted with the house at No. 1 Broadway, which had been requisitioned for Knox’s headquarters, and she basked in the deference shown to her military husband, now a colonel and on intimate terms with General Washington. In July, the Knoxes joyfully celebrated the reading of the Declaration of Independence, but hardly had time to savor the heady moment, for suddenly the British fleet loomed off Staten Island. Henry sent Lucy back to Fairfield, where she slumped in misery. All the news was bad; there was a rout on Long Island, New York City was taken, and the Continental Army had retreated into New Jersey. A family Christmas with their first-born was impossible; Henry was on the banks of the Delaware using his mighty voice to shout General Washington’s orders to each unit as it embarked across the stormy river. It was Knox who directed the famous crossing of the Delaware by Washington’s army on Christmas night, 1776, and it was his artillery that cut down the Hessians as they emerged sleepily from their quarters. Meanwhile, Congress had promoted him to brigadier general. The hazardous crossing in adverse weather allowed Washington to lead the main body of the Continental Army against Hessian soldiers garrisoned at Trenton, New Jersey. You will before this have heard of our success on the morning of the 26th instant. The enemy, by their superior marching, had obliged us to retire on the Pennsylvania side of the Delaware, by which means we were obliged to evacuate or give up nearly all the Jerseys. Soon after retiring over the river, the preservation of Philadelphia was a matter exceedingly precarious — the force of the enemy three or four times as large as ours. However, they seemed content with their success for the present, and quartered their troops in different and distant places in the Jerseys. Of these cantonments Trenton was the most considerable. Trenton is an open town, situated nearly on the banks of the Delaware, accessible on all sides. Our army was scattered along the river for nearly twenty-five miles. 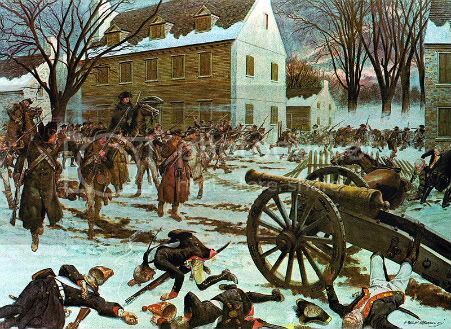 Our intelligence agreed that the force of the enemy in Trenton was from two to three thousand, with about six field cannon, and that they were pretty secure in their situation, and that they were Hessians — no British troops. A hardy design was formed of attacking the town by storm. Accordingly a part of the army, consisting of about 2500 or 3000 passed the river on Christmas night, with almost infinite difficulty, with eighteen field pieces. The floating ice in the river made the labor almost incredible. However, perseverance accomplished what at first seemed impossible. About two o’clock the troops were all on the Jersey side; we then were about nine miles from the object. The night was cold and stormy; it hailed with great violence; the troops marched with the most profound silence and good order. They arrived by two routes at the same time, about half an hour after daylight, within one mile of the town. The storm continued with great violence, but was in our backs, and consequently in the faces of our enemy. About half a mile from the town was an advanced guard on each road, consisting of a captain’s guard. These we forced, and entered the town with them pell-mell; and here succeeded a scene of war of which I had often conceived, but never saw before. The hurry, fright, and confusion of the enemy was [not] unlike that which will be when the last trump shall sound. They endeavored to form in streets, the heads of which we had previously the possession of with cannon and howitzers; these, in the twinkling of an eye, cleared the streets. The backs of the houses were resorted to for shelter. These proved ineffectual: the musketry soon dislodged them. Finally, they were driven through the town into an open plain beyond. Here they formed in an instant. During the contest in the streets, measures were taken for putting an entire stop to their retreat by posting troops and cannon in such passes and roads as it was possible for them to get away by. The poor fellows after they were formed on the plain saw themselves completely surrounded, the only resource left was to force their way through numbers unknown to them. The Hessians lost part of their cannon in the town; they did not relish the project of forcing, and were obliged to surrender upon the spot, with all their artillery, six brass pieces, army colors, etc. The number of prisoners was above 1200, including officers—all Hessians. There were few killed or wounded on either side. After having marched off the prisoners and secured the cannon, stores, &c., we returned to the place, nine miles distant, where we had embarked. Providence seemed to have smiled upon every part of this enterprise. Great advantages may be gained from it if we take the proper steps. At another post we have pushed over the river 2000 men, today another body, and tomorrow the whole army will follow. It must give a sensible pleasure to every friend of the rights of man to think with how much intrepidity our people pushed the enemy, and prevented their forming in the town. His Excellency the General has done me the unmerited great honor of thanking me in public orders in terms strong and polite. This I would blush to mention to any other than you, my dear Lucy; and I am fearful that even my Lucy may think her Harry possess a species of little vanity in doing [it] at all. Lucy had shown the force of her passions when she fought her parents for permission to marry. Now she was faced with life in a historic moment which could not be changed to suit her, and with a husband who put his duty first. And there were no longer parents to comfort her. Perhaps when she fled from Boston it had been rather fun to defy them, but now she felt deep hurt that no letter came from them. Through an aunt she learned that her father had continued to draw a salary of £300 as Provincial Secretary and worked to obtain compensation for dispossessed Tories, savagely denying the claims of those he suspected had ever shown the least sympathy for the American cause, as if hitting out at his daughter through them. Henry was never spared a detail of her anxieties and loneliness. 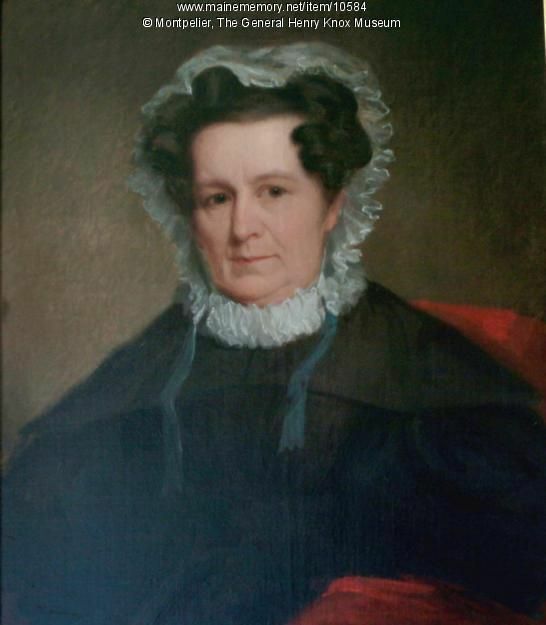 From Wallingford, Connecticut, where she and a Mrs. Pollard rented a house together, their landlord wrote to General Knox to report the crockery broken and the cellar of West Indian rum consumed, and without actually accusing the ladies he may have given Henry fears that his young wife was drowning her sorrows. It was a relief when Lucy moved back to Boston, where she had friends, and could also be kept busy helping Henry’s brother Billy run the bookstore. I wrote you a line by the last post just to let you know I was alive, which was all I could then say with propriety for I had serious thoughts that I never should see you again, so much was I reduced by only four days of illness but by help of a good constitution I am surprisingly better today. I am now to answer your three last letters in one of which you ask for a history of my life. It is, my love, barren of adventure and replete with repetition that I fear it will afford you little amusement. How such as it is, I give to you. In the first place, I rise about eight in the morning – so late an hour you will say, but the day after that is full long for a person in my condition. I presently after sit down to my breakfast, where a page in my book and a dish of tea employ me alternately for about an hour. When after seeing that family matters go on right, I repair to my work or book or pen for the rest of the forenoon. In the afternoon, I commonly take my chaise and ride into the country or go to drink tea with one of my few friends…. then with any of the former, I often spend the evening, but when I return home how that describe my feelings to find myself entirely alone, to reflect that the only friend I have in the world is such an immense distance from me to think that he may be sick and I cannot assist him. My poor heart is ready to burst, you who know what a trifle would make me unhappy can conceive what I suffer now. When I seriously reflect that I have lost my father, mother, brother, and sisters – entirely lost them, I am half distracted. But dare I say, I sometimes fear what a long absence… may lead you to forget me at sometimes, to know that it even gave you pleasure to be company with the finest woman in the world, would be worse than death to me. But it is not so, my Harry is too just, too delicate, too sincere – and too fond of his Lucy to admit the most remote thought of that distracting kind. Don’t be angry with me, my love – I am not jealous of you affection. I love you with a love as true and as ever entered the human heart, but from a difference of my own merit, I sometimes fear you will love me less – after being so long from me – if you should, may my life end before I know it – that I may die thinking you wholly mine. When the Continental Army encamped at Valley Forge for the bitter winter of 1777-78, Lucy was allowed to join her husband. She lived in contentment in a big stone house beside Henry’s artillery park, and became a pleasing hostess to cold and threadbare officers. Somehow the Knoxes always managed to provide extra food and wine, and at night there was often dancing and singing. At this time the relationship between the Washingtons and the Knoxes burgeoned. Henry Knox was already close to the Commander in Chief, but now the ladies became close in spite of twenty-five year age difference. Both came from a background of privilege, Martha was a country lady; Lucy was more urban. They devoted their time to sewing, mending, and attending the sick at the encampment. Lucy grew in self-importance as she informed the older woman on matters of protocol. The Knoxes were of special value to the Washingtons in this time of open criticism of the General. With the spring of 1778 came, the glorious news that France had recognized the American republic and would send aid. Then camp was broken, the men prepared for battle, and the women scattered to their homes. 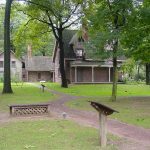 The separation of soldiers and wives was brief this summer, however, for by August the last major battle in the North was fought at Monmouth, and the army settled down to await a move by the British in New York. The new encampment was at Pluckemin, New Jersey, where Henry created an artillery park with an academy attached for the training of officers (the forerunner of West Point). Lucy joined him, and there enjoyed an almost settled life for nearly two years. The Knoxes gave a ball on February 18, 1779, attended by seventy ladies and three hundred gentlemen. It was opened by General Washington, who led Lucy onto the floor for a minuet (in spite of her advanced pregnancy). There was dinner, a fireworks display, and dancing til dawn. French help and plans for a concerted attack put an end to life at Pluckemin. Henry hurried away to collect the largest supply of artillery he could raise and see it transported to Yorktown, while Lucy went to Mount Vernon, where she became a companion to Martha Washington. Lucy was envious of the fine house and life at the Virginia plantation, and she wrote Henry of her longings for a home of their own. It was the final battle of the war at Yorktown, VA, in October 1781, that demonstrated Knox’s genius. The accuracy of his guns devastated the British forces penned up on the narrow Yorktown peninsula. 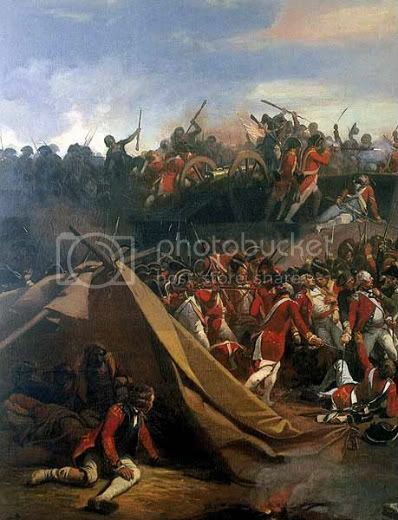 Eight days after Knox opened fire, the British General Charles Cornwallis surrendered. Knox’s reward was the promotion to major general, the youngest in the army at 31. The Knoxes lived through the prolonged period of near-peace at Newburgh, New York. Henry was in command at West Point and had the duty of disbanding the Army. After peace was signed, Henry and Lucy moved to a house at Dorchester, outside Boston, and then to a house on Boston Common, rented from the painter John Singleton Copley. Lucy’s pregnancies had been following fast upon each other. The Flucker estates were now Lucy’s, awarded to her as the only non-Tory member of the Flucker family. Henry looked over the Maine lands while on a mission to the Penobscot Indians. He noted the fine sweep of the St. Georges River as seen from the settlement at Thomaston, and deemed it an ideal spot for a future home for Lucy. It had to remain a dream for the moment, however, because the Confederation Congress named Henry Knox Secretary at War, in charge of both the Army and the Navy. During his tenure, most of the War Department’s work focused on Indian affairs. The Continental Congress made Knox Secretary of War under the Articles of Confederation on March 8, 1785. He held that position without interruption until September 12, 1789, when he assumed the same duties as the Secretary of War in Washington’s first Cabinet. Henry took up his new duties in New York. Lucy, annoyed that he had rented a country house on Bowery Lane, arrived from Boston in June with the children. The house was four miles out from the center of the city, but this did not prevent a continual stream of carriages from arriving to receive the Knox hospitality. Lucy soon got her way, and a fine town house at No. 4 Broadway rang with the voices of her children and was kept lit far into the small hours to the sound of music, laughter, and the cries of Lucy’s victims at whist. Lucy had added to the mouths to feed by producing four more children in less than four years. New York became livelier as the national capital under the Presidency of George Washington. The Knoxes who were called upon to shop for the brown broadcloth of American make for George Washington’s inauguration suit. Henry Knox stood close behind the President as he took his oath of office at Federal Hall, and the President came to the Knox house to watch the fireworks display in New York Harbor. Their impressive position seemed expressed in their outward appearance – Henry and Lucy had both become enormously fat. The sturdy youth had turned, at near forty, into a monumental man of 290 pounds. Lucy, now thirty-three, weighed 250 pounds and carried herself with tremendous hauteur. After ten years serving his country as Secretary of War, Henry Knox began to long for the life of a gentleman farmer, like his friends George Washington and Thomas Jefferson were living on their country estates. Fortunately, Lucy had inherited a vast tract of land in the District of Maine. Montpelier stood three stories high, topped by a cupola, surrounded by broad piazzas, fronted by columns. A princely house, it was served from a crescent of nine outbuildings behind it — a cookhouse, a distillery, a buttery, an icehouse, stables, blacksmith and carpenter shops, and dwellings for servants, grooms, and gardeners. There, Henry was to dedicate his “all to the development of the District of Maine,” and attempted to live the life of a wealthy squire. Most in Thomaston welcomed him, despite what was perceived as his wife’s haughtiness and fondness for gambling, as well as his struggles with squatters. He invited more than 500 townspeople to an open house at Montpelier, helped establish a local church, was instrumental in starting local militia groups, and employed many people. Tragedy struck their country home when William, aged eleven, and Augusta, aged nine, died on the same day, probably of diphtheria; and within a year, Julia, an enchanting girl of fifteen, died of rapid consumption. Lucy’s final pregnancy produced a stillborn child. In the end, only three children were spared of the thirteen she bore — the eldest, Lucy; Henry Jackson, who caused endless heartache by his instability; and the youngest, Caroline. When thoughts of bereavements could be pushed aside, the Knoxes’ life for the next ten years was a happy one. They spent winters in Boston and returned to Montpelier in the spring, when Henry toured his acres, planning, expanding, and running up debts that would ultimately bankrupt his heirs. He was industrious in lumbering, ship building, stock raising, and brick manufacturing, although all of these businesses failed. Henry spent the rest of his life engaged in cattle farming, ship building, brick making, and real estate speculation. He assembled a vast 1,000,000-acre real estate empire in Maine through graft and corruption, triggering an armed insurrection by local settlers who threatened to burn Montpelier to the ground. While visiting a friend, Henry Knox swallowed a sharp chicken bone, which lodged in his esophagus, and three days later, on October 25, 1806, he was dead at the age of fifty-six. He was buried on his estate in 1806, mourned by a country that had come to love him. 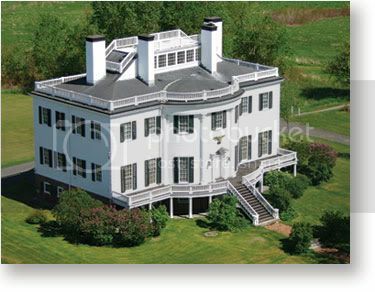 In Maine, however, Henry Knox would be remembered as a grasping tyrant and was forever immortalized as the model for Colonel Pynchon in Nathanial Hawthorne’s House of the Seven Gables. Lucy faced life without Henry. When the military funeral was over, the last reverberations of the gun salute were stilled, and the rich tones of the Paul Revere bell at Henry’s church had dwindled to silence, Lucy closed herself into Montpelier, and lived on in genteel poverty. She sold much of her property to pay off debts and to support herself. Houses encroached on her isolation, and the forest was cut down behind Montpelier. Henry’s ornamental gardens grew ragged, the paint peeled off the house, and the piazzas became unsafe and were removed. Lucy’s health declined; then a severe illness brought fever and delirium. She laughed and talked of gowns and hairdressing and friends long gone, and called out to Henry across a crowded ballroom. On the night of June 19-20, 1824, she became frantic and her daughters struggled to restrain her. Lucy Knox died June 20, 1824, at the age of 68, having outlived her husband by 18 years. 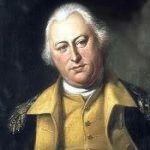 An award for patriotism in Henry Knox’s name is presented yearly in Thomaston on his birthday, July 25, and then once more the beat of marching feet is heard, bugles blow, and the Paul Revere bell peals. Lucy is remembered only in an inscription on her husband’s monument; she is a footnote in the history of her time. She made a contribution, however, to the republic by loving a man who served it nobly and by caring for home and family in his many absences.